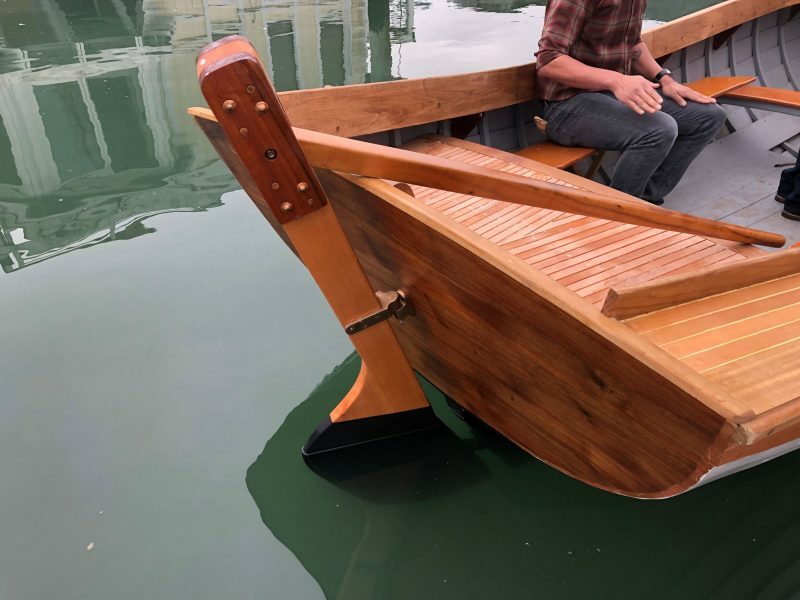 As 2018 came to a close a new year and new wood boat were getting ready to launch. 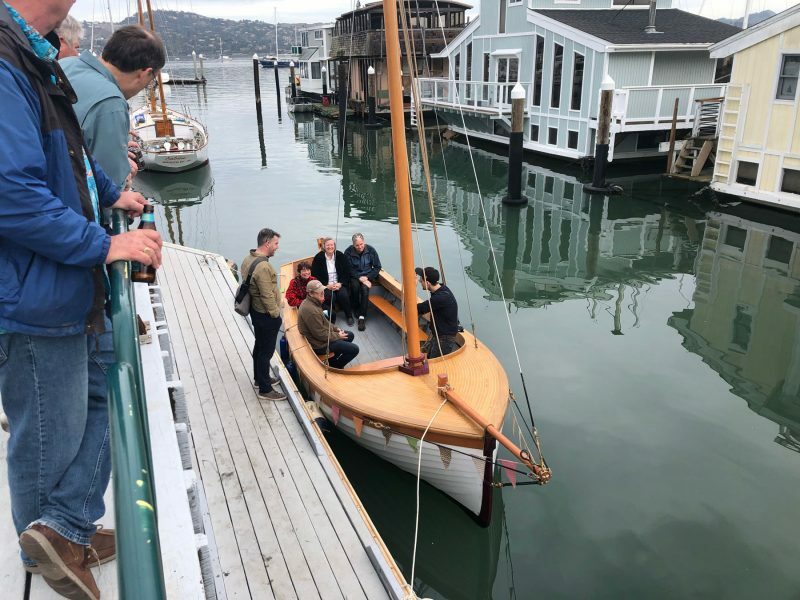 Spaulding Marine Center hosted the christening of a seven-plus-year building project by J. Parsons, who designed and built the classic in his garage at home in Tiburon. (One of the first steps was building the garage!) The boat is the culmination of vision and hard work accomplished with the help of friend and craftsman Brian Turner. Together they brought to life a unique, beautiful and elegantly built gaff-rigger that Parsons envisioned sailing the Bay. Launch day drew a steady parade of admirers. Parsons’ long-time woodworking hobby tended toward the square corners of cabinetry. Following retirement earlier in the decade, the self-taught dinghy sailor became interested in boatbuilding. 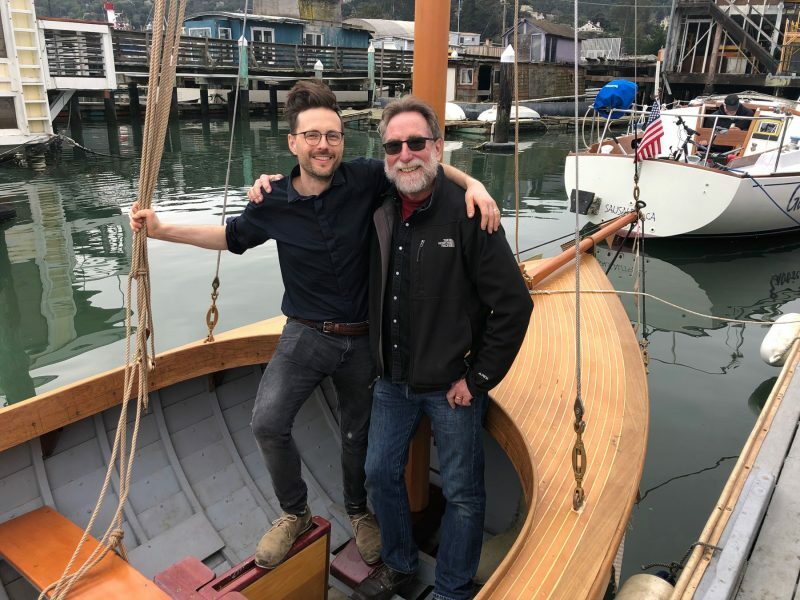 In 2010, he signed up for classes with Bob Darr at the Arques School of Traditional Boatbuilding at Spaulding in Sausalito. While learning to build boats — cabinetry with curves — in 2011-12 he drew the lines for a sailboat that Darr suggested was worth building. With lines drawn and this encouragement, Parsons decided to move ahead. Brian Turner, on the left, was J. Parsons’ right-hand man throughout most of this building project. The keel was poured in 2012, but proper building couldn’t really begin until Parsons added the aforementioned garage to his house. With the garage finished and the project underway, he enlisted the help of fellow Arques student Brian Turner. The two of them have made it happen over the past five and a half years. The devil is in the details. These details are rich with diverse, handcrafted woods, from pepperwood to Douglas fir. The building project didn’t leave much actual time for sailing, so Parsons got his fix by sailing J/24s out of OCSC in Berkeley. At 20 feet, the new boat is very different from a J/24, but just as ready for the Bay. With a nod to The Hobbit, her fine-grained soul was christened Treebeard. She has a full keel yet also a daggerboard to help windward performance. If all goes according to plan, the rig and final pieces will be finished early this month and she’ll get her first sail by the end of the month. Careful details are found from bow to stern. She’ll be a standout wherever she sails. She’s got a lovely sheer and stout build, and looks finely crafted for many great years of sailing on the Bay. If you happen to see her sailing by, send us a photo, as we can’t wait to see her with sails hoisted. We’re sure she’ll be as beautiful under sail as she is at the dock. “Believe me, my young friend, there is nothing — absolutely nothing — half so much worth doing as simply messing about in boats.” — Kenneth Grahame, The Wind in the Willows. I would love to see the original drawings to get a feel for the full keel and shape of the hull and transom. 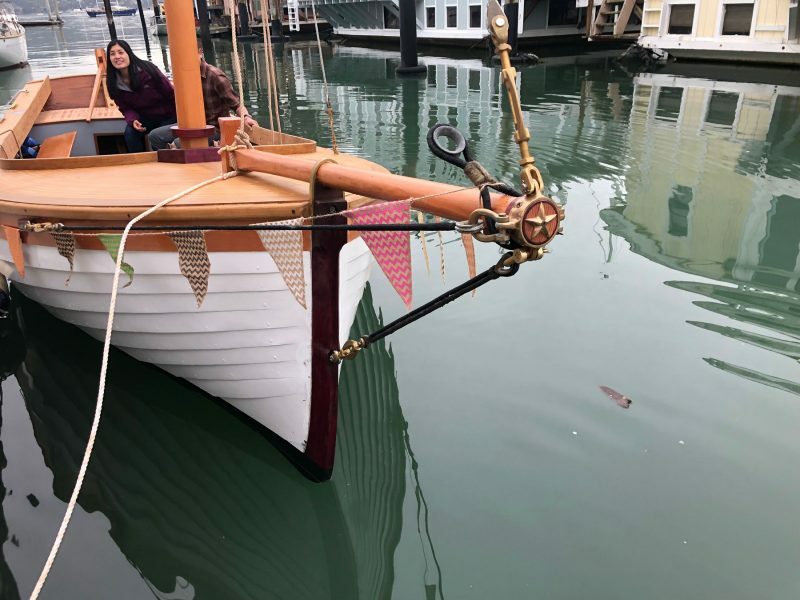 We – who have already lost our hearts and wallets to wooden boats – salute you.